TunnelBear VPN offers free plan to testify their services with good encryption. It is an easy-to-use VPN with advanced features like Internet Kill Switch and many others at a reasonable speed. Price of TunnelBear is also affordable with several secured payment options. TunnelBear does not offer instant support that discourages users to use this VPN. Geographical range and diversity is limited with no protocol selection. You cannot access Netflix U S(with full speed) and are restricted to enjoy torrenting with this VPN. If you want an affordable and user-friendly VPN to anonymize your digital identity then for a shorter period of time; TunnelBear VPN is the right option. Although, their speed and limited servers can’t match the competitive threshold. But still, the VPN provider offers reasonable features to have it installed on your device. TunnelBear is exceptionally one of the resolute VPN service provider available in the market. Its exclusive features, outstanding privacy protection regimes, rapid access to world-wide websites, strong encryption offers holistic VPN solutions to maximum number of users. TunnelBear VPN hides the IP address and data of the users and shields personal information from third-party as well as hackers interference on local networks, public Wi-Fi, and ISPs. Users can safely access all their emails, preferred websites, domestic and international newsflash and showbiz while travelling overseas. Moreover, TunnelBear VPN can dodge restrictions and keep all the online activities secure that helps the users to play safe when accessing the websites. The VPN limits the advertisers from tracking everything that is done over the network when users go online to enjoy browsing anywhere in the world. Our TunnelBear Review highlights all the features and the ways it has helped users to get access to numerous websites used over twenty countries. What is TunnelBear & Who Owns TunnelBear VPN? TunnelBear VPN is relatively not a very old service provider, popped up in 2011 based in Toronto, Canada. Ryan Dochuk and Daniel Kaldor are the cofounders of this Virtual Private Network, which has introduced online privacy to plenty of users all over the world.TunnelBear is an international VPN that successfully managed to gain trust among the users around the world; merely providing them the sense of comfort and ease-of-use. It is natural to be a skeptic when it comes to new service, especially when security and privacy are at stake. TunnelBear free VPN is a big hit in Canadian regions and TunnelBear free download process takes only few seconds. TunnelBear offers simple, private and free access to the internet you love to browse through. It ensures complete online privacy and is worth upgrading to its paid VPN version. TunnelBear VPN also allows you to remain anonymous while browsing on your iPhone, Android Phone etc. Whether you want to watch live online streaming, enjoy your favorite TV shows over the web, or even perform secure transactions, TunnelBear VPN is a smart option to choose for all these and many more activities that you wish to keep secluded from the prying eyes. Continue reading our TunnelBear VPN review and unzip the great many features they have to offer. Is TunnelBear Safe to Use? Is It Safe To Trust A VPN Service Operating From Canada? Apparently No. It is not wise to trust a VPN provider operating from Canada. But when it comes to TunnelBear, they have a very basic rule, they do not log any of the users’ online activities and a proof of this statement is their transparency report. TunnelBear is the only VPN in the world that has published an independent security audit. Why One Should Buy TunnelBear VPN? The contemporary landscape of VPN providers can be considered as highly proliferative and saturated but at the same time characterized as highly unregulated. Almost all the VPN providers are more or less offering the similar package plans, but still has the USPs for their respective clientele. Here you will find the detailed review of one of the simplest VPNs; TunnelBear, we have tried to provide a 360 view of this VPN. We hope this guided-review would facilitate your VPN purchase decision and take away all the queries. In this review of TunnelBear VPN we dive into the service bit-by-bit, to see how well it outscored against the competition and gained a remarkable position in the market within a short period. Before highlighting TunnelBear features, let’s consider the financial model of this VPN since pricing plans are one of the most critical factors in any purchase decision. Little is the name of TunnelBear’s free to download VPN service. It offers lightweight extensions and tunnels down browser data. It works on variety of devices including desktop as well as mobile. It also extends services to Windows and Android devices. Further, it provides easy interface for Chrome and Opera as well. TunnelBear VPN offers its users a free version for trial purpose with a preference to pay for more bandwidth. This free version offers 500MB data to the users when they download and install the application. However, according to the TunnelBear review, it also has additional option where the users can tweet about this VPN program in order to receive additional 1GB of bandwidth for the month free of cost. Giant Plan- The users need to pay only $9.99 per month and get access to desired websites with unlimited data for the month. It also has an option to pay for annual subscription only at $119.88 to let the users enjoy hassle- free browsing with unlimited data throughout the year. For the Grizzly plan, the users’ needs to pay only $ 4.99 per month for unlimited plan which is 49.88 for the annual subscription. It requires an upfront payment for the entire year. If you purchase the Grizzly plan you will get the best value of your money as it is on 58% discounted price compare to the Giant Monthly plan. TunnelBear also offers mobile-only pricing plans specifically just for their mobile device users; you can buy this plan in addition to a regular (Giant or Grizzly) plan, to secure an additional mobile device. While our team was working on TunnelBear review, we found that the mobile-only plans are categorized monthly, quadruply, and yearly. Can I have TunnelBear coupon? Users get TunnelBear Coupon, which consists of a code. It helps them can save their money on VPN services. Most of the VPN service providers charge huge amount of money on each of the services they provide. TunnelBear VPN services beg to differ! They offer services at different charges depending on the plan you choose. You could buy their plans at premium prices after the end of trial version. However, you could utilize TunnelBear coupon code to get huge discounts, for example, discount on VPN service, discount on premium VPN service and many more. These discount coupons help the users to enjoy browsing without any restrict and that too at a much lower rate and privacy protection. Moreover, TunnelBear review can be followed for an insight into the types of discounts offered by the service providers. Currently, TunnelBear VPN is not hosting any promotional deal or coupon, however, on various occasions, they offer promos and coupons, so keep checking for it. What about the accepted payment methods of TunnelBear VPN? Being an elite VPN provider with international standards, TunnelBear accepts all the leading and internationally trusted payment channels including; VISA, Mastercard, and American Express. All these channels are highly secure and trusted by VPN users for years. Sadly in the process of reviewing TunnelBear, we found that it is no longer accepting PayPal but does offer anonymous mode of payment; Bitcoin, to give users a sense of extraordinary security and anonymity. If you are looking for a reliable and secured VPN service provider accompanied by high-speed networks and servers that give immense security and anonymity as desired, then TunnelBear VPN is one of the most profound options. TunnelBear divides the features strategically into four fundamental paradigms, let’s explore how far these standards are benefitting the users to enjoy safe browsing anonymously. Multiple server locations: It lets the users’ to connect with the fastest servers over 20 countries VPN. Keeps you anonymous: It hides the IP address of the users to protect them from being hacked from unwanted users. Sets you free from pop-ups: It blocks all the advertisements, analytics and social media trackers to let the users play safe. A kill switch means no data flowing through a network interface outside the VPN tunnel, in case of VPN connection drop out. This feature stops any encrypted data to leak-out to the ISP and secures your digital activities. TunnelBear comes with a kill switch with a name VigilantBear, that block all the internet traffic as soon as you disconnect from a VPN. VPN kill switches are most often combined with questionable P2P downloads that contradict with the digital copyright enforcement laws prevailing in the region. Since TunnelBear based in an area with strict no P2P policy does not allow P2P traffic or in other words, you can not enjoy BitTorrent downloads from their servers. TunnelBear claims that they don’t keep logs of their users’ activities and user’s privacy is paramount; just like other VPN service providers. Being outsiders, we can never be entirely sure how a VPN operates, so what we supposed to do; should we trust what the company says? The above claim is a little misleading because TunnelBear log specific information, but don’t worry! Your IP address, your online activity, and browsing history are not at stake. The only data it collects is metadata which includes; OS version, Application version, total data usage, user’s monthly presence, usernames, email addresses, billing address, twitter account, log duration and amount of bandwidth utilized. TunnelBear keeps the generic data to optimize its VPN servers to ensure maximum speed and server performance for its users. Data collected upon account sign-up remains confidential by TunnelBear and never shared with any third party in any case. You may consider checking other complete logless VPN service providers to go anonymous online. Does TunnelBear VPN offers Money Back Guarantee & Refunds? Unfortunately, TunnelBear does not offer money-back guarantee and refunds; this is fair because VPN users can testify their services on their Little plan. We prefer you to try their services for free before jumping into the deep end. Comparing TunnelBear with others premium VPN service providers, reveals that this is among the few VPNs that do not offer this feature; this is because it is one of the top VPN services. This TunnelBear review seconds their refund approach; guarantees that the service will never fail to satisfy your digital security needs and you will never demand a refund. The software runs smoothly with no connection breaks in the service. Though it is a mandatory offering these days, but as per the company’s policy, they don’t seem to offer any refunds till date. Last but not least, TunnelBear automatically connects you with the nearest and fastest available connection; choosing the closest server on their own is a debatable added value feature. Auto-tunnel determines the suitable tunnel for you and connects you to the location with the lowest “ping”(make sure that your data travel the shortest distance). It lets you connect automatically to any WiFi network that doesn’t appear in your trusted network list. Once you launch at startup, you don’t need to reconnect upon restart; as VPN of TunnelBear is always on. You can access two different VPN protocols in Tunnelbear encryption; different platforms use OpenVPN while iOS users get the choice between Layer 2 Tunneling Protocol(L2TP)/Internet Protocol Security (IPSec) and Internet Key Exchange version 2 (IKEv2). An iOS user can also get OpenVPN via third-party OpenVPN Connect software. Strong 256-bit Advanced Encryption Standard (AES) used across different platforms, apart from iOS 8 and earlier. All this information is available on TunneBear’s blog. It is the TunnelBear’s version of what most VPN providers call ‘Stealth mode.’this Feature masks OpenVPN traffic to get around firewalls (like the Great Firewall China) by executing obfsproxy as a SOCKS proxy. This turns the encrypted data less detectable to ISPs, businesses, and governments; appear as a regular traffic to avoid being noticed and blocked. Disabling GhostBear feature doesn’t reduce the digital security threshold, it just a stealth mode that bypass firewalls and halts ISPs to know that you are using VPN; that might lead to ISP throttling – cutting bandwidth of the connection. A slight drawback of using GhostBear feature is that it slows down your internet traffic (though I didn’t find personally. In case you see your speed slowing, it’s better to stick with regular OpenVPN User Datagram Protocol (UDP), and enjoy the best speed without GhostBear. TunnelBear is compatible with all the internet enabled devices and operating systems including; PC, Mac, iOS and all the android screens. An icing on the cake is that you will get a customized version of TunnelBear on every other device. An official TunnelBear software can easily be downloaded on any device for free. Now you can create your TunnelBear account on Linux and other TV boxes like Apple TV and Chromecast, by manually following a user-friendly configuration available on their website. Like other VPN providers, TunnelBear offers you access to across five devices with a single login, without compromising the security of any device. Unfortunately, there are no clear guidelines on TunnelBear website regarding the limitations associated with Multi-Login facility. TunnelBear Netflix – Can I access Netflix USA with TunnelBear VPN? One of the topmost On-demand entertainment services is Netflix that offers blockbuster hit movies, shows, documentaries, series, and many more to the millions of the subscribers worldwide. But, unfortunately not every subscriber can access the entire Netflix library due to a geo-restriction policy. Content discrimination exists everywhere except the US; Viewers get the most and the best content than non-US subscribers. VPN is the only safest option left to the discriminated users to enjoy unrestricted access to Netflix US from anywhere in the world. Sadly, TunnelBear does not allow users to stream geo-restricted content and to bypass Netflix VPN detection mechanism. We suggest users to choose a Netflix VPN service to access unrestricted Netflix content while being anywhere round the globe. During our TunnelBear review, we found that the service provider is not as feature-rich as its competitors. For starters, note that TunnelBear VPN does not have as many servers as the average VPN service does. Most VPN providers have servers in at least 30 to 40 countries; PureVPN has servers in 141 countries, surpassed all the other VPNs in the geographical diversity. In contrast, TunnelBear operates with a network of 354+ VPN servers spread out within 20 countries around the world. Countries include; UK, Canada, US, Germany, Japan, France, Australia, Netherland, Italy, Ireland, Hong Kong, Mexico, Spain, India, and few more. You can connect to any of these server locations with any of the TunnelBear plans. As you select the country, the sophisticated network architecture will connect you with the fastest VPN server available in that country/region. TunnelBear offers a dedicated help page consists of articles of status updates, getting started, Accounts and Payments, Browser Extension Help, iOS App Help, Windows App Help, Mac OS X App Help, and Android App help. Thanks to the Page search button that will help you find the articles related to your queries. In case you can’t find the answer on the TunnelBear help page, you can directly contact the company, but unfortunately, there is only one-way contact the company is the online contact form, that responds within 24 hours. TunnelBear VPN doesn’t offer phone and live chat support, not even their social accounts are active enough to respond instantly; you will be re-routed to their complaint ticketing form. It would be nice if TunnelBear considers extending their support services to live chats and phone support. Your today’s queries would be resolved by tomorrow, so be careful while filing a complaint. Our TunnelBear review concludes the company’s support a bit weak compared to the service provider, it can definitely improve. 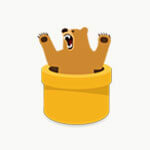 TunnelBear VPN PC website is amusing and well-crafted, that is easy to navigate brimming with bear puns. The homepage layout is loaded with images not overly dense with information, making the website both disarming and tranquilizing. It is relatively different than other VPNs, where you be exposed to so many things as soon as you arrive. You can easily navigate to your desired area from the labeled pages directly from homepage. You will find all the other tabs; Download, Pricing, My Account, Features, Help, and About Us, as you scroll down the homepage. Further navigation options are available at the bottom of the homepage so that you can easily jump directly to their blog. TunnelBear blog is again the marketing practice to share valuable information and educate the basics of a VPN and related queries. Although TunnelBear blog does not update frequently, it has the necessary articles and explanations of key aspects. Now, that you know all the features of TunnelBear, you’re just a step away to get a Bear to protect you from digital threats. TunnelBear VPN setup is easy and straightforward, for free version all you need is email and password that leads to the downloads page. Go to TunnelBear Website and click on ‘Pricing’ button. Select the Premium Plan you want to buy and click on it. Create your login and pay your invoice. Once your account is created you will need to download the TunnelBear app on your respective device. How to download TunnelBear VPN? Users can download the TunnelBear software from their own website, with these quick and easy steps. Downloading the software takes seconds, and you come across a setup wizard to walk through the process; TunnelBear application requires only 20 MB to install. After installation, you just need your login details to be filled-in to enter into the protective umbrella of TunnelBear. Lastly, TunnelBear prompts you to check your inbox and verify an account confirmation email. As soon as your account confirmed, you can start using all the Tunnelbear VPN services. Click on the download button present on the homepage of the TunnelBear website. After selection of the device, download gets completed and the users’ is required to feed in the relevant data to sign up, for example – name, email and password. Once the user enters the details, TunnelBear sends a confirmation link via email id provided by the user. Clicking on the confirmation link will take the user to a tutorial page for easy to use directions. Once verified, you will be directed to the gray map with available servers, you can select the auto option to let the client detect your location and also open a drop-down menu to let you choose your desired region. After choosing the specific region, just toggle the button ON on the top left corner and you are connected. Green color shows all good in the hood. Can I Torrent with TunnelBear VPN? Torrenting or P2P is the widely used file sharing method, offers accessibility to millions of blockbuster content. However, due to its infringing nature, torrenting is banned in many regions; though there are various ways that ensure anonymous torrenting, and VPN is one of them. Unfortunately, TunnelBear does not allow torrenting to its users and those who have tried reported degradation in there bandwidth speed. Therefore in this review, we don’t recommend you to use TunnelBear for uTorrent, BitTorrent or any other torrent client. TunnelBear VPN is the most easy-to-use and user-friendly VPN software that offers no complicated menus or configurations. Operating and accessing TunnelBear does not require extensive skills; you just need to follow the given instructions to avail all the features. The outlook of a software follows a wood-panel theme that stands out among other VPNs, that follows chrome-based themes. Now in our TunnelBear review, let’s talk about each software and application you can download and use. TunnelBear software can be downloaded on Windows, i.e. on your personal computer, to browse data over countless networks. The TunnelBear VPN software has been designed to serve the best to its users’ to have the safe browsing experience. Windows is one of the compatible modes where users can download TunnelBear as any other software with little effort. The TunnelBear website has some extremely useful videos that guide the users to install the VPN easily. The TunnelBear review reflects that these videos not only saves time but also give a real experience of how to go step by step and get most accurate way to run the software. How to install TunnelBear on Windows? As soon as the user clicks on any of the tabs, the software gets downloaded on the PC. Accept the terms and conditions and finish with the installation process. Once the process gets completed, the user can continue with the desired work with the Virtual Private Network. The users may also follow the TunnelBear review to get access to the installed software and its application. You may also check other VPN for Windows options to see what is best for your PC. Users can also use TunnelBear VPN on their MAC supported devices. There are number of ways to get the TunnelBear software on the Mac device and the quickest way is to follow the video tutorial uploaded over the website. MAC devices are also compatible mode where users can download TunnelBear as any other app only with little effort and browse their contents by following easy to go steps as described over the tutorials. Besides any other app installed over the device, TunnelBear software would not create any issue during installation or while browsing. In fact, it will block the ads that create a problem while browsing any data. TunnelBear review would help the users’ to identify the areas that need to be followed while continuing with their own work. How to install TunnelBear on MAC? Once installed on the device, click on the agreement where terms and conditions are provided. Once the user agrees with the terms, the process gets completed. After completing the process successfully, the user can move on with their application at once. You can alternatively check other best VPN software for Mac and compare from other best options we have. TunnelBear VPN operates on Android devices and allows the users get going with their network access in a hassle-free manner. TunnelBear Android app is somewhat similar to the iOS app. The interface of the app is simple and user friendly. Users may select the server and thereafter connect instantly within few seconds. The TunnelBear Android app is compatible with those smartphone that has Android 4.0 version and above. Users can download the same from Google Play Store. Following the TunnelBear review over play store itself will give an idea how the interface of the network is. Moreover, users may get quick access to any of the selected websites as soon as they get the icon of the app on their screen. How to install TunnelBear on Android? Click install tab to start the process, which will hardly take few minutes, depending on the user’s network. Once installed, the user will get the icon on their screen. Run the application and agree with the term to begin with the application and enjoy browsing. In case any problem arises, the TunnelBear review will provide a value added support in case of compatibility of the user’s device. We have compared top Android VPN apps, you may consider checking other options too. Carrying the latest model of iPhone, but not able to access the desired website with best efforts? TunnelBear is the solution to this issue. TunnelBear VPN can be installed on the IPhone or iPad device too. Users are free to install the app on their device to get access to the desired websites anywhere anytime. Users may download the most compatible version of TunnelBear with latest features that would run on their device. TunnelBear review highlights the significant points that are relevant to the iPhone or iPad device on which TunnelBear is to be downloaded. The iPhone users are concerned with the security of the applications that they download. TunnelBear is not only secured VPN in itself, but it also secures the device from malware and unwanted hackers. How to install TunnelBear on iPhone/ iPad? Get started with the unique VPN features and experience the best browsing service. The TunnelBear review underscores the compatibility of the device and the version of the software that lets the user enjoy browse the websites without censorship. Since TunnelBear offers free VPN, we’d highly recommend to check our blog on best free VPN service for iPhone, and get yourself more options to play with. Offering services on Linux platform are the trademark that only few of the top VPN providers successfully achieved, and TunnelBear is one of them. TunnelBear dedicated app for Linux is not available yet; users need to configure TunnelBear manually on their Linux systems. A detailed step-by-step assistance guide is available on the tunnelBear website. Does TunnelBear VPN works in China? Censorship regulations are aggressively follows in the People’s Republic of China. All the leading social networks, search engines and other sites (YouTube, Facebook, Twitter, Instagram and many more), in China has banned. In fact, many VPN services have been shot down by DPI mechanism used by GFW (Great Firewall China). But, luckily TunnelBear is one of the surviving VPNs that has stayed firmly against GFW and allowing their Chinese users to access all the restricted services in China. Note: It is important to understand that bypassing Great Firewall of China is cat-and-mouse game. The authorities keep shutting down VPNs, so you always need to check if your opted VPN is working in the country. You can always check our updated list of reliable VPNs to use in China. With all the platforms we analyzed in this TunnelBear VPN review, includes an exclusive Google Chrome Browser Extension. TunnelBear VPN chrome is one of the widely used platforms among the users, that can be downloaded from Chrome Store. With TunnelBear chrome, you can access multiple geo-restricted contents promptly without compromising your digital privacy. TunnelBear for Chrome: Installing TunnelBear extension for Chrome will tunnel the browsing data of the users and enable them to surf the restricted world of internet privately. TunnelBear review highlights that users’ have experienced the internet as if they were in some other country. The TunnelBear application blocks the online trackers to create disturbance while surfing over the websites. Therefore, users can now install the application over Google chrome and enjoy the services to make the most out of it to surf over the censored websites anytime and at anyplace. Congratulations – you become a part of 8 million anonymous networks. When it comes to online streaming entertainment, an award-winning entertainment platform; Kodi/XBMC comes to mind. The great news for the Kodi lovers is that TunnelBear is one of the Kodi affiliated VPN providers; offers an appealing interface, handy features and cross-platform, to let users enjoy an exceptional services of Kodi and its unbeatable content. Geo-restrictions is usual with on-demand entertainment services, and Kodi is not an exception; now you can safely bypass all the Kodi restrictions with the TunnelBear. Wait! We know Kodi streamers love to have more content and add-ons on the list, so consider checking our list of best VPNs for Kodi that actually work. It is as easy as removing any other app in your PDAs; you just need to delete TunnelBear app from your devices to get away from TunnelBear. In case of Windows, you can remove TunnelBear by going to Add remove programs and select the client to uninstall from the system. Who should use TunnelBear VPN? The TunnelBear target market is average users, those who don’t want a high degree of control over background processes. The software lacks customizable settings and high features when it comes to comparing with other top-class VPN providers. There are other cheap VPNs in the market that offer more servers, better software clients and are more secure. It is rare that a VPN provider offers a free version, TunnelBear is an exception. For this reason alone, TunnelBear VPN is the best option for those who want VPN for a short period, but not for the long-term users. We recommend looking at other VPN providers, till the time TunnelBear mature and improve their features and offerings; but now TunnelBear is too young to give it a try for the long-lasting security. These were the average customers’ reviews about TunnelBear VPN. The review statistics reflects that the platform has received its rating based on ease of use and functioning. What could be better than accessing the worldwide websites without any restriction and fetch relevant information from a limitless source? TunnelBear VPN services aim exactly the same. It could prove to be helpful in rescuing from online restrictions by providing easy access to the filtered out sites. It works at a blazing fast speed, and is easy to use on a slew of devices. It is bang on in terms of customer support. However, TunnelBear is yet to please the users who prefer to hide their identity during online gaming, while watching Android or Apple TV, or while using Kindle or eReader, etc. In addition, it offers restricted support for Linux. However, considering the voluminous benefits it ensures, these cons are next to negligible. Hopefully, the VPN provider would be mulling at improving on its drawbacks as well. Overall, this VPN is a feasible option to use owing to its affordable rates, smart speed and multiple server availability. Overall TunnelBear is not extraordinarily impressive, since many other clients are offering a diversified range of servers and compatible features at comparable rates, and are way successful than TunnelBear. We feel this VPN provider is little too bland, but we do believe that as the company grows improvements would go hand in hand. We are hopeful and curious to see what TunnelBear becomes in the next few years; as every new VPN has natural barriers and challenges to overcome. We expect them to mend their services and to expand their geographical locations. What We Don’t Like About TunnelBear VPN Service? Following are the features which are missing from TunnelBear services. If TunnelBear added these features in the service they definitely can become one of the best VPN service in the world. Not a single private internet browser offer absolute anonymity and remain unprotected throughout your online presence; your IP address never stops revealing your real identity and threatening your privacy. With TunnelBear, you can change your real IP instantly and can surf the internet anonymously and heck the hacker’s intelligence; even on a free WiFi.